Marvel Is On Fire With Their Trailers Today! With new trailers for Deadpool 2 and Jessica Jones, plus a teaser for Venom, Marvel is killing it with their promos today! Our review of the first episode of the new TNT show "The Alienist". I just finished Marvel's The Punisher on Netflix and I gotta say that I'm really impressed! This is such a breath of fresh air after some pretty disappointing Marvel series: Luke Cage (C+), Iron Fist (D), The Defenders (C+). The Punisher is filled with great performances, pretty smart writing that pounds in relevant themes (revenge, capital punishment, veterans respect, gun control, post traumatic stress, justice), and stellar/graphic action. Every character seems to have a role to play in the story and is given enough time to be fleshed out for that purpose. I don't think there's any acting that stood out badly for me. 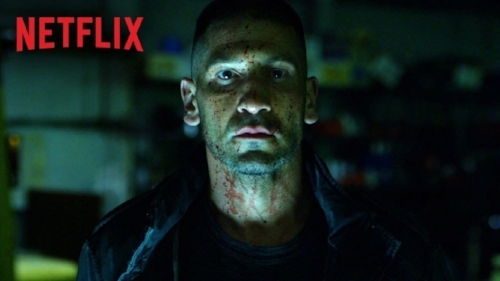 Jon Bernthal gives Frank Castle both believable rage as well as vulnerability. His performance invests you in the character and makes you empathize with his extremes. As far as flaws go, I'd say two stick out to me: the antagonism could have been focused a little better and the whole show is just WAY too long. I think the show could've benefited from sticking to one clear villainous threat the whole season. In addition, 13 episodes were just too many; so much that certain subplots and scenes seem to drag as filler. Overall though, this is a solid entry into the Marvel Netflix universe and is my third favorite series within it (behind Daredevil and Jessica Jones). I'd give it a strong B. It's GOOD! Our spoiler-free look at the second season of Stranger Things. Our spoiler-filled discussion of "Stranger Things" Season 2 is here! Come check out what we thought and leave your thoughts! Is "Marvel's The Inhumans" Really That Bad? Our review of the "Lucifer" panel from San Diego Comic Con 2017. Read out recap of the panel for "Krypton" from San Diego Comic Con. Part 2 in our "Things to do at home when you miss Comic Con" mini series! Today we're looking at movie and show trailers!